Clifford D. Mansley, Sr. is an well-known second-generation penman in Oregon who has filled hundreds of commissions for his calligraphy and sold over 170,000 copies of the popular As For Me and My House (Joshua 24:15). 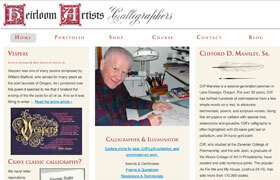 Clearly, his work had to be the overarching element of his website. For his work portfolio, we designed a system of icons to allow users to toggle between a grid view and item view, and easily navigate through individual pieces or multiple folders. A Shopify storefront allows ease of use for shoppers and easy updating by our client.